Need more Sleeping Space? Need more Floor Space? We’ve got what you need! 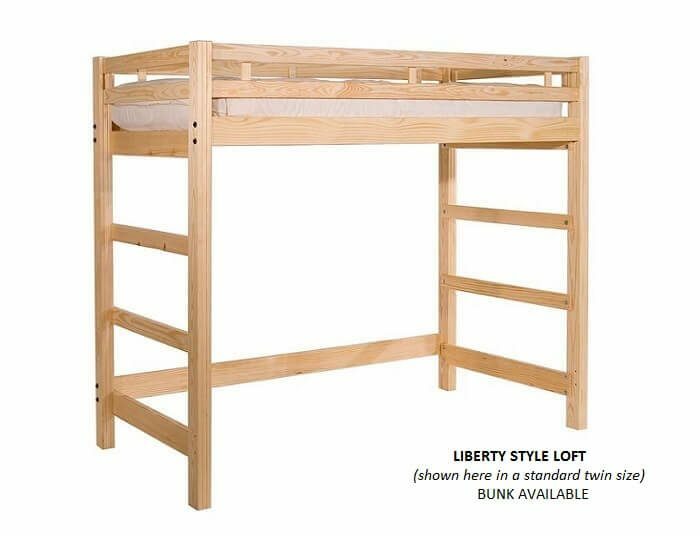 We are one of the few manufacturers who make loft and bunk beds in sizes larger than Twin or Twin XL! 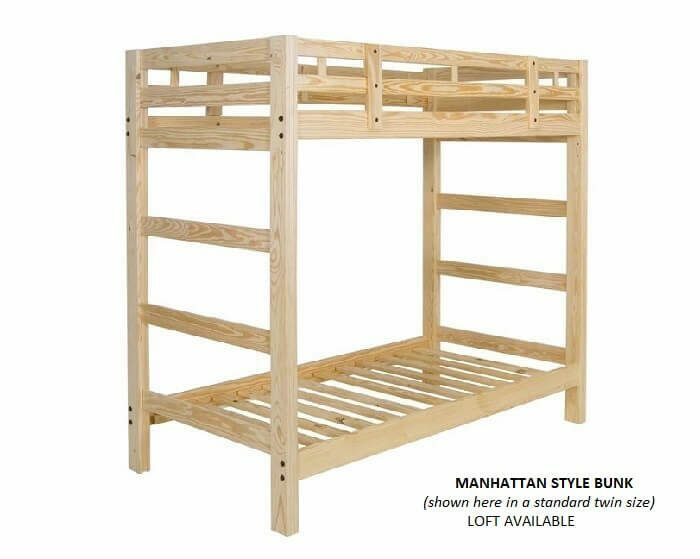 All of our lofts and bunks can be made into a Full, Full Extra Long or Queen Size, and All Styles can be made as a loft or a bunk. 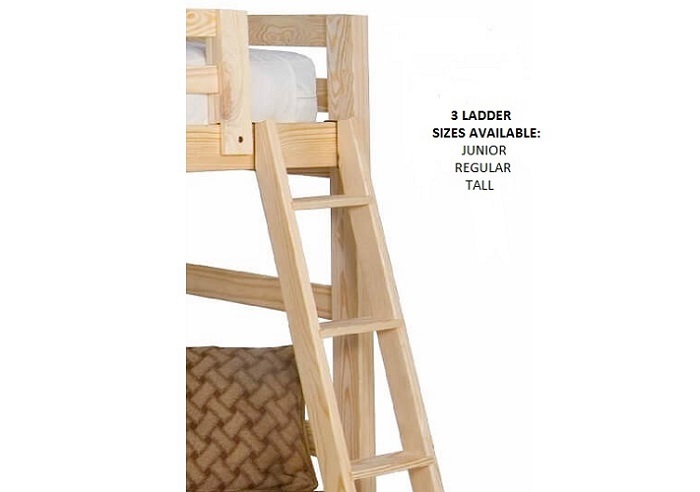 Of course, we also have the mattresses and ladders so you can get everything that you need in one tidy shipment. Call us for a shipping quote! 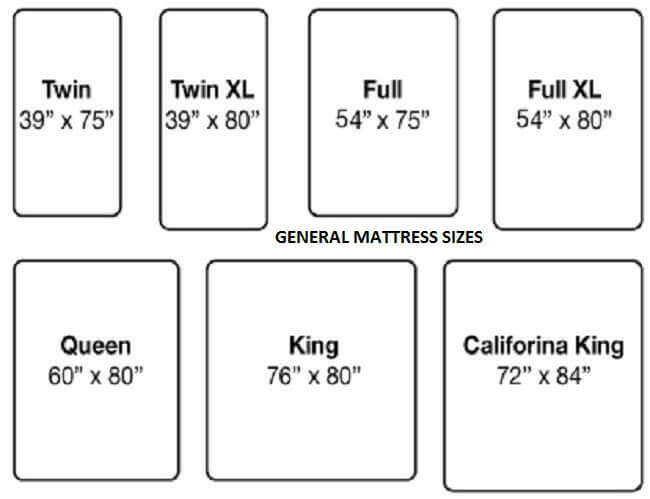 Maximize Your Sleeping Capacity with Bigger Beds! Whether you’re looking to outfit a camp or a rental, or just trying to accommodate enough guests (or enough kids maybe), bigger beds tend to help. We have so many options for you to choose from! Most of our Eco-style Lofts and Bunks can be made to accommodate a Full Size Mattress or Queen Size Mattress (we can also do Full XL)! Alternatively, if you just need a Twin Extra Long, we do that too! The biggest difference between Twin Size Units and these oversized lofts and bunks is the size, but there are subtle differences that are noteworthy. Our Twin Size lofts and bunks have an adjustable under-clearance that you choose at the point of assembly; this is helpful when you need to decide if you would rather have more under clearance or more headroom. 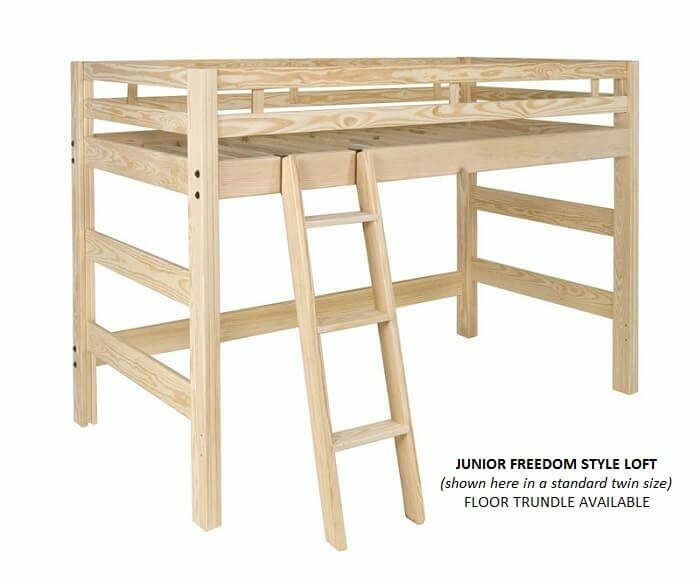 The Full and Queen Size lofts and bunk beds listed here have a mid-support that runs directly down the center of the length of the bed. This mid-support is securely fixed into a notched out area on the end panels so that it cannot move. Bunks have two mid-supports and lofts have one. This is super for safety purposes, but you do lose the option to have adjustable under clearance. (The Twin sizes offer a choice between 52 Inch and 54.5 Inch under clearance, whereas almost all Full or Queen models will have a fixed under clearance of 52 Inches. The Manhattan Style will have a fixed under clearance of 60 Inches). These lofts typically take the 4 step ladder, but the Manhattan style will use the 5 step ladder. 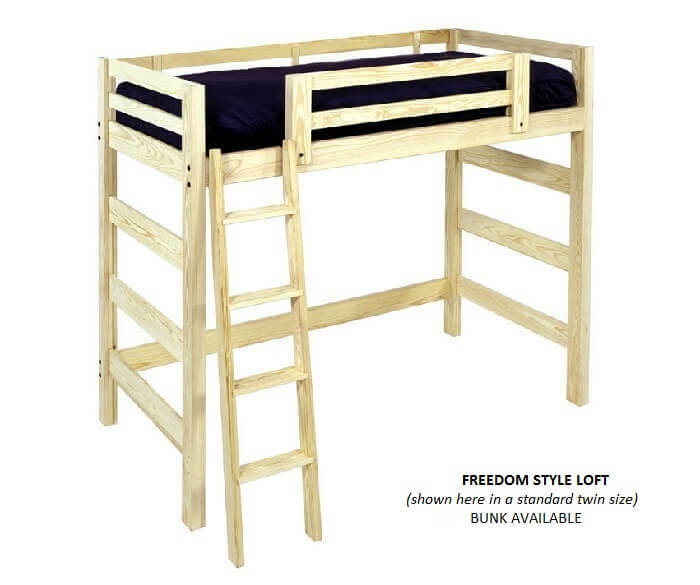 Loft or Bunk? Or Split Bunk? It depends on what you need or want. A loft will give you one large bed up high, which is amazing if you want lots of floor space and just need a bigger bed than a Twin Size. 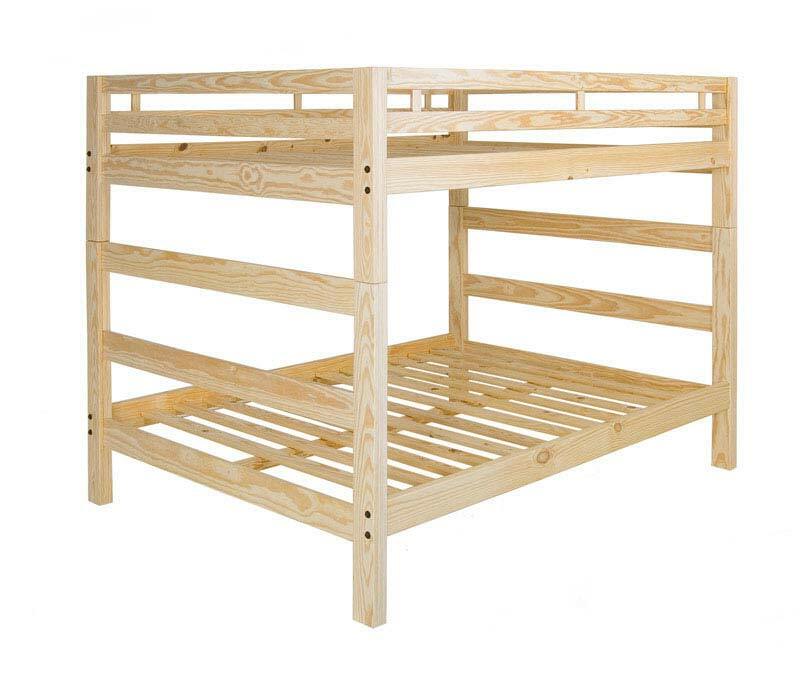 A bunk bed will give you two large beds one on top of the other. 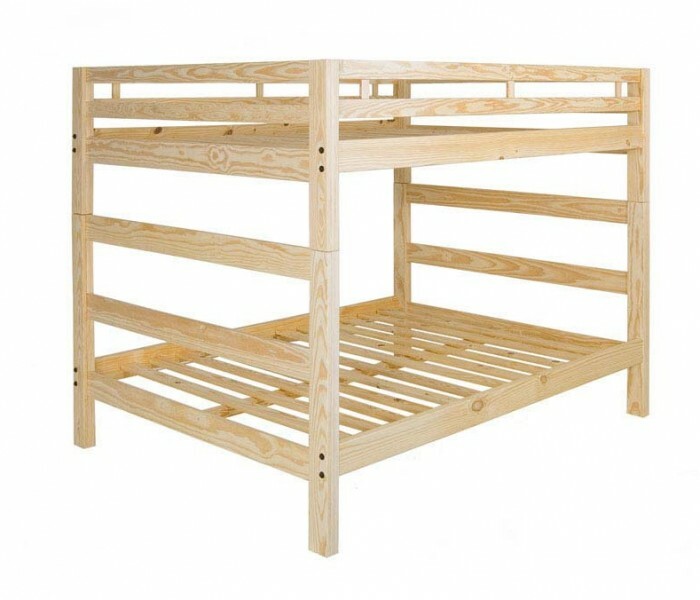 Finally, a Split Bunk will give you two large beds that can be separated easily into two freestanding platform beds. Totally versatility! Full, Full XL or Queen? Many people take advantage of the floor space under our Loft Beds by using our futon couches, futon sofabeds or loungers for seating as well as a spare bed, while others use it for shelving, storage, etc. Check out our complete selections Nightstands, Dressers and Tables for even more ideas.